You may think a mobile restroom toilet is the last thing you need. If so, you are very wrong! It could become an extremely valuable resource in the event of a disaster, whether man-made or natural. Hurricanes, wild fires, earthquakes, terrorism and other disasters can prevent the use of public services such as water and sewer for days, weeks or months. What would you do if this happened to you and your family? Portable toilet potties, like the Uncle Jon, provide a safe, hygienic means for your family to survive should something happen to the infrastructure normally relied upon. Unlike many portable restroom toilet devices, this one requires no chemicals, gas, electricity, or even water in order to operate. How is that possible? The dry flush cycle used by this type of portable restroom toilets use a plastic sleeve cartridge that does all the work. All you do is when the liner becomes soiled is lift the lid and use convenient grab bars to pull fresh plastic from the cartridge and the waste automatically moves into the base compartment. Lower the lid and the unit is again ready for use. All the smelly waste and potentially dangerous bacteria are sealed safely away. After the portable toilet is flushed about 40 times, the waste storage container in the base, with the waste contents safely inside, is easily disposed of safely. Your hands never have to touch the waste so you and your family maintain their hygiene, health and safety. Portable restroom manufacturers recognize the need for safe and easy to use devices like mobile toilet facilities for situations such as hurricane disaster areas. Because many disaster areas do not have an easy means of disposing of messy bags used by many portable toilet potties, they have designed this hygienic solution. To help provide the privacy required by families forced to live in less than optimal conditions due to a disaster, there are small tent-like devices which can be purchased at little cost to place around the Uncle Jon™, ensuring that no one has to see you or the children using the device. Uncle Jon™can also be a great addition to a primitive camp house. If you do not wish to carry water from the hand-pumped well or stream and do not wish to install expensive septic tank and plumbing equipment, Uncle Jon™ can provide your needs for a long weekend or a whole summer in these primitive, natural conditions. The portable restroom weighs only 44 pounds, making it easy to place where ever you desire. Of course, we all hope that natural disasters never cause us to wish we had purchased a mobile restroom toilet, but we simply can’t predict the future. Having a disaster plan and key equipment needed should you find that your home and security suddenly vanish can make a difference in the quality of life your family enjoys during disaster recovery. 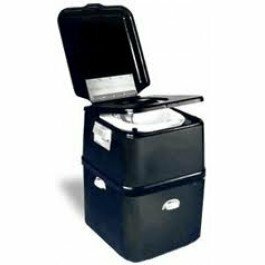 You’d prepare for your disaster plan by storing food and drinking water, so you surely want to provide for your family’s sanitary toilet needs.